By now, most have heard about the earthquake swarm (*1st Update* now upwards of 20 earthquakes 30 earthquakes over the past month since November 1, 2013) happening in the vicinity of Azle, Reno, Mineral Wells and Springtown, Texas and near Eagle Mountain Lake and Dam. The most recent one this morning was a 3.7 Magnitude. Since we've written extensively about dams and fracking, specifically, the Joe Pool Lake Dam, we believe there should be a more heightened sense of concern from our Texas oil and gas regulatory agency, The Railroad Commission of Texas. We don't see any recent Press Releases about this issue on the RRC's web site. Our local North Texas news outlets are reporting on this issue daily. BREAKING--3.7 Magnitude earthquake reported overnight near Mineral Wells. 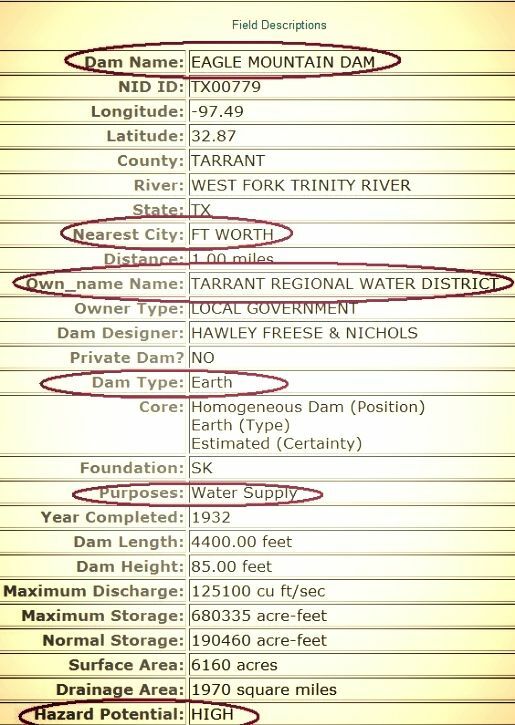 We are baffled since it is such a serious matter for those living near this dam and for all of us who live in North Texas. The industry has clearly and irresponsibly drilled and fracked directly below this earthen dam. 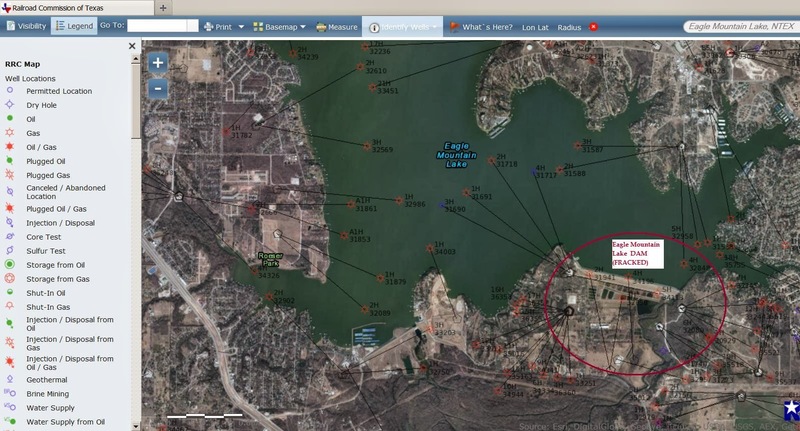 What is the Railroad Commission of Texas's Plan of Action regarding this North TX earthquake swarm in the vicinity of the Eagle Mountain Lake Dam? This is an earthen dam ~ already designated as "High" for hazard potential because of the people and property in such close proximity. We will post the reply here when we see or get a response. Have a very nice day, y'all. Click on this map to enlarge it and see the details. In case you missed it, we wrote about DRHorton's retention of minerals for their properties last year. Click here to read about that. In recent weeks, we have discovered that our Grand Prairie, TX Gas Drilling Ordinance doesn't address the issue of homes being built dangerously close to gas drilling sites AFTER a drilling site is already established. Denton Drilling Blog has been writing about this somewhat confusing issue as well. (Denton, TX currently has a 1,200 Ft. protected use setback, by the way. Many residents had wanted it to be 1,500 Ft. with the latest revision to their Gas Drilling Ordinance in January 2013.) Read about that here. Our current Grand Prairie, TX Gas Drilling Ordinance addresses protected use setbacks for already established protected uses...including homes, schools, hospitals, nursing homes, businesses, day care centers. That protected use setback is 700 Feet with a variance of 500 Feet in certain cases that must be approved by City Council. (Our group and city staff had advocated for a 1,000 Ft. setback back in 2011, but unfortunately our City Council decided upon the 700 Ft. setback.) A 1,000 Ft. setback for parks is the current rule (with stipulations). Here's a Chart available to everyone on the Grand Prairie, TX Web Site and prepared by the Environmental Services Department. It shows the new provisions enacted when the Revised Gas Drilling Ordinance was voted in on January 18, 2011. We like the detail it shows for new permits vs. old permits. According to our current city Gas Drilling Ordinance, it appears that DRHorton or any developer can build homes in Grand Prairie as close as they wish to drilling sites when the pad site already exists. Or maybe they are working off of the 200 Ft. State of Texas protective setback requirement for oil wells in densely populated areas ~ a statewide requirement established long before horizontal drilling? Not sure. Important: If a drilling rig were up, then people might be more aware. But there has not been a rig up since 2011 according to the Grand Prairie Gas Drilling Status Report (Page 6). But most people will have no idea what to expect with future drilling operations. This is an URGENT matter that must be addressed by our cities in North Texas. What are we doing to our communities and to the families that only want to live the American dream of owning a home? We must address this Critical Issue. NOW. Kurt Will Not Run in May. News Flash. Let's talk. Has anyone else been wondering about those BIG, Beautiful Signs all around town and those BIG, beautiful, colorful Campaign Flyers in the Mail? Good Grief!! This is a local election!! Serious $money$ has been spent!! Right click on this picture to enlarge it. Another News Flash. We've heard from several reliable sources that current Grand Prairie, TX Mayor Ron Jensen (who also happens to have Chesapeake shale gas wells on his property) was not endorsing any candidates running for these two races (City Council District 3 and City Council At-Large District 7). 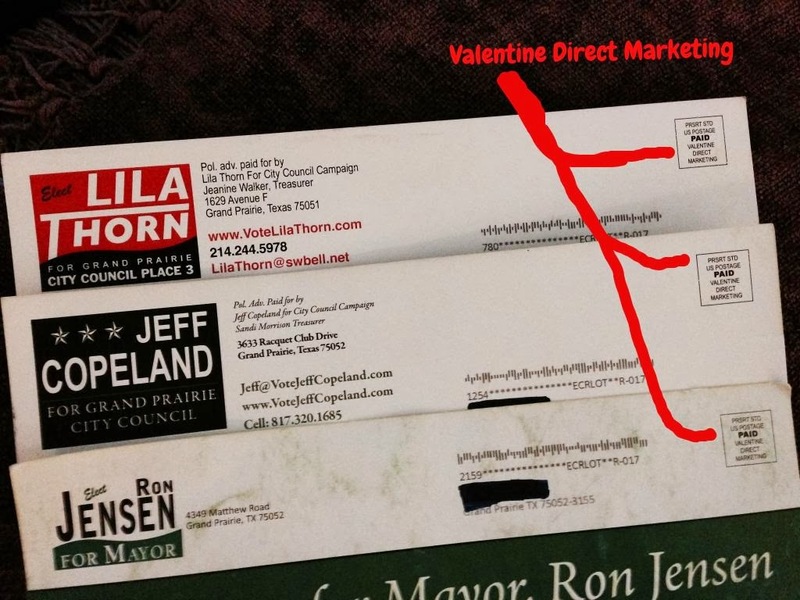 Hmm...We don't think it's simply a coincidence that the same mail company that created first-time city council candidates Thorn and Copeland's flyers also created Mayor Jensen's flyers in the mayoral race last spring (see the picture above)...well, when they call it a SPECIAL Election, we now know what that means! It's one big happy SPECIAL Family!! Hopefully, you are still reading because there's a lot more. We've also discovered that not only did shale gas industry executives from Newark E&P and Beacon E&P heavily fund the chosen candidates (Lila Thorn Total Donations from Oil and Gas reported thus far and from 9/26/13 through October 26, 2013 = $1,000.00 and Jeff Copeland Total Oil and Gas Donations as of 10/26/13 = $10,000.00) but these two candidates spent the BIG BUCKS they received from ALL their donations with a Dallas, TX printer Valentine Direct Marketing. Booker Industries shows on the Campaign Finance Reports (same address as Valentine Direct Marketing. Click Here for the 2nd Address for Valentine). We've linked to the latest finance reports for the two candidates below on Scribd. We'd like to know how this kind of spending is good for Grand Prairie's Economic Development? Wow. It sure looks as if local businesses lost out big time. 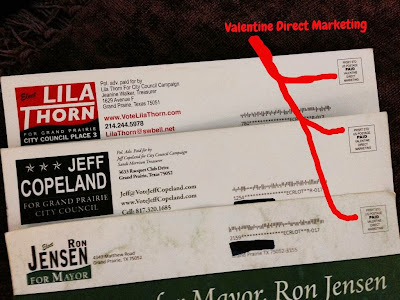 Any candidate running against these two SPECIAL candidates (Ms. Thorn and Mr. Copeland) should have been forewarned that the oil and gas industry would make the campaign totally UNFAIR and highly profitable for a Dallas printing and mailing company. If you haven't already early voted, we still hope you will vote Tuesday, November 5, 2013. We suggest candidates who didn't receive the BIG BUCKS from shale gas operators hoping to gain favor and votes for expansion of their operations in Grand Prairie. We have endorsed Kurt Johnson Place 3 and Charlie Womack for Place 7 At-Large. These two men believe that residential drilling is wrong for our communities. We agree wholeheartedly. Please vote Tuesday, November 5, 2013 for Kurt and Charlie. 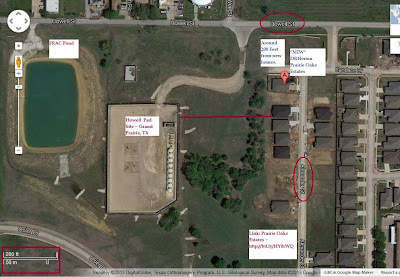 Back in 2010, there was a general feeling from our group in Westchester and individuals and groups in Dallas that there was something bizarre going on at the Joe Pool Lake Reservoir (a man-made Texas lake primarily used for flood control and recreation) in southwestern Dallas County, Texas. The story about Joe Pool Lake mineral leases being flipped by Bernie Madoff in New York and elsewhere was already quite the buzz back then. Then something else began to brew in early 2011 that encouraged our group. And then there was silence for awhile. *Update*: Stay tuned for an update to the current Moratorium. Of course, it's a doozy. Click here to review the Texas Resource Management Plan (1996) defining the Zones of Exclusion for oil and gas exploration and extraction near USACE-managed dams in the State of Texas. Page 21 for Lake Benbrook's Dam. APPLAUSE!! Happy 3rd Anniversary to the Westchester Gasette. We launched the Westchester Gasette blog on September 8, 2010. It's been a very wild and often strange ride. Click here to see our very first blog post exactly 3 years ago today. It's simply a video about land farming elsewhere in North Texas created by Texas Sharon. It features a very nice, soothing song. Thank you for joining us for this journey into gasland over these past 3 years. There's lots of water under that bridge. Or rather (thankfully) lots of water remaining behind the Joe Pool Lake Dam. "...ballistics systems that help optimize the value of oil and gas assets." 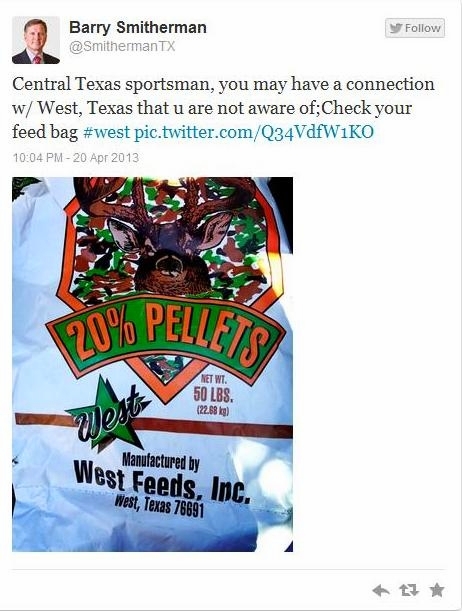 Our Grand Prairie, TX Gas Drilling Ordinance doesn't appear to address this issue. Since it hasn't been updated since January 18, 2011, we think it's about time for a revision. How many of these PERF Jobs have been conducted already near our communities? Dare we ask? Also, click here to read the story and the comments on Bluedaze, today. Rest in Peace Mrs. Jackson. City Councilwoman Mrs. Ruthe Jackson died today. It is a sad day for our city. She Loved Grand Prairie, TX and We Loved Her. Our Joyful Hymn of Praise. Amen. Labels: Grand Prairie TX City Councilwoman Ruthe Jackson, Rest in Peace. Range Resources Violated State Laws in Water Contamination Case ~ Brett Shipp Investigates! Click here for Brett Shipp's earlier story about the Parker County, TX methane-contaminated water well from February 2013 ~ in case you missed it. Steve Lipsky's Water is On Fire from Recent Fracking ~ RRC Says, "No, It's Not!" Featured in the Debut of Josh Fox's "Gasland 2" on HBO Earlier Tonight. It will run at various times all week. Watch carefully, as Steve Lipsky's water catches on fire. for this important report earlier this year. Happening Now. Zero Fossil Fuels Used. "[...]Zero-fuel airplane's epic flight to New York live! Check out the triumphant conclusion of the historic crossing of the United States with the world's first airplane able to fly day and night without fuel! Solar Impulse, a project born in Switzerland, is ending its Across America mission that started exactly two months ago at NASA's Moffett Airfield at the heart of Silicon Valley. Click here to visit the Solar Impulse YouTube Channel for incredible videos of this first solar flight across America!! And the Winner Is ~ Mayor Dr. Bob Cluck is the Best of the Worst in North Texas! We don't fully understand all the upset about bike trails by these Arlington, TX residents. But we do understand being upset by time limitations during Public Meetings. "I'll Smile If I Want To!" deserves the Prize and All the Kudos. Therefore, Mayor Cluck is the Winner! Hands Down. Beginning in the summer of 2011, it seems the Arlington, Texas City Council and especially the Mayor went off the tracks. Click on over to the Fishcreek Monitor to see some more of that derailment. In the world of public administration, this is probably a textbook version of what you don't want to happen. But it did. And it's a lesson in politics. People like to be heard no matter what their viewpoints. If politicians in America don't want to listen, maybe they need to do something else. Or move to another country. If you haven't already voted early, be sure to vote this Saturday, May 11, 2013! In Texas, it's now one of the few things we own that can't be taken by private industry via eminent domain. Hold on to it with your dear life. 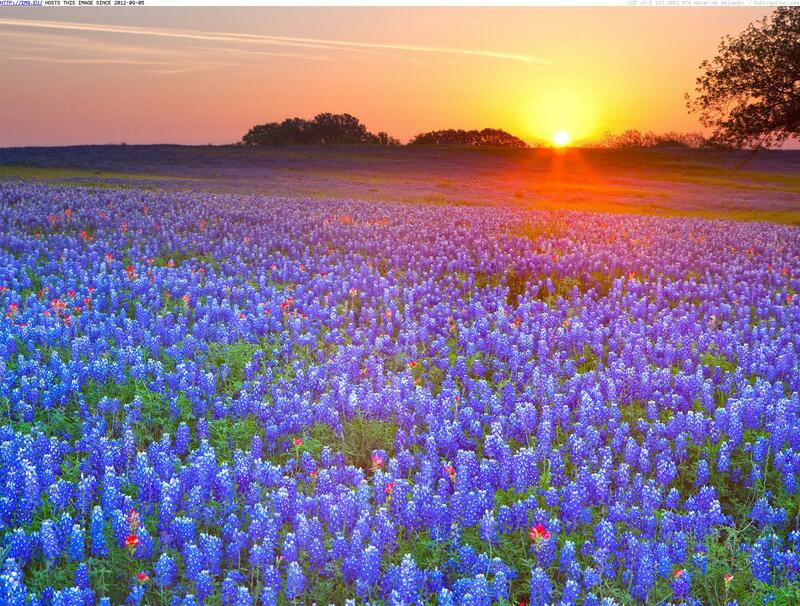 We Will Not Forget West, Texas. We have no idea how tweeting a picture of a bag of deer pellets to the "Central Texas Sportsman" is supposed to provide any kind of comfort and help to fellow Texans in West, TX ~ following the catastrophic explosion that killed at least 14 first responders on Wednesday night. Here's the Tweet that Chairman Smitherman probably won't be making. Be sure to click on the Reuters link to read the story. Thanks to GFLakeGasWatch, gardencatlady and Fishcreek Neighbor for tweeting about this with us today. We appreciate their concern and many others who retweeted and replied. All of us want answers to what happened in West, TX. Irving, TX City Council. Thank you. **UPDATE** December 13, 2015 ~ In light of the Irving/Dallas Quakeswarm that began to kick in by 2014 on the "eastern" border of Irving, go to 48:56 to hear the beginning of the discussion about the "Monstrous" Fault on the "western" edge of Irving, Texas. Watch the entire video to hear some amazing information from an O&G industry executive asked to fill in many blanks for a North Texas City Council. Go to 8:00 to Hear the Dr. Pepper Declaration from Tom Blanton of Trinity East/EXPRO Engineering/Keystone Exploration. Listen to ALL of this Irving, TX City Council Meeting Briefing 2 weeks ago ~ if you can. It may open your eyes to some gas-industry spin that has successfully managed to "git er done" all across North Texas. We note how Mr. Blanton refers to "The Luna Site," [sic] as if it's already been approved by the City of Dallas. This was by far some of the best questioning of the industry we've heard by a City Council in the Barnett Shale ~ and all of it in broad daylight! Note: Mr. Blanton refers to a "Perfect Seal" at around 20 Minutes. And how there is "no way that a fresh water zone could have been contaminated by a production casing failure." Oh, and at 22 minutes be sure to hear Mr. Blanton tell Councilman Gallaway how many wells Trinity East has drilled IN TOTAL. Be amazed. It's all quite revealing. According to Mr. Blanton, Trinity East wants to drill and frack 60 shale gas wells on 3 Sites at the borderline of Irving and Dallas in Dallas City Limits. This includes construction of a Processing Plant and/or a Refinery 1/2 mile from North Hills Prep in Irving and at the Northwest Entryway to the City of Dallas. In Summary: Trinity East has drilled a total of 12 wells in the Barnett Shale and 100 wells in Texas. Two (2) wells were drilled at the border of Irving and Dallas by Trinity East in 2008 and 2009, respectively. The Dallas Lease's well FAILED. 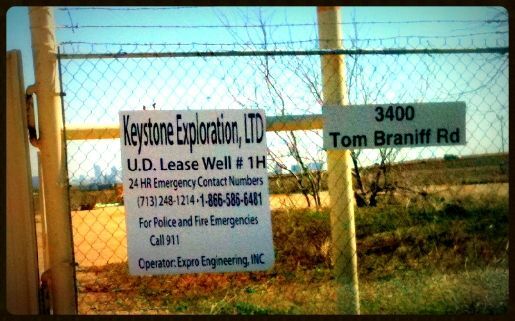 Trinity East now wants approval (from Dallas) to drill up to 60 wells (in the Trinity floodplain) after having that production casing FAILURE (during fracking) at 3400 Tom Braniff in 2009. See this previous Westchester Gasette blog post about the Trinity East "FRAC Job" casing failure. TRINITY EAST Permits Including a Massive Polluting Processing Facility at the Northwestern Entryway to the City of Dallas, Texas. 1500 Marilla. 6th Floor. Amen. *Update* So, here's what Trinity East wants to do next!! What kind of madness is this?! If someone does a bad job do you continue to do business with them just because you have a contract? Isn't there a way out of this bad business deal?? What the He**?? Click here to view the CPC Agenda for March 21, 2013. *Update* Good guess by Fish Creek Neighbor in the comments.